With its Fascination parlor, generous collection of classic spinning rides, dizzying array of colored lights, and other retro touches, Knoebels transports guests to a bygone era. To add to its status as a classic amusement park, Knoebel's is one of the few remaining free-admission, pay-per-ride parks. It's family-owned and -operated, which is a rarity these days as well. In fact, the Knoebel family has been running the property since 1926, and its personal touch and pride is evident throughout the park. 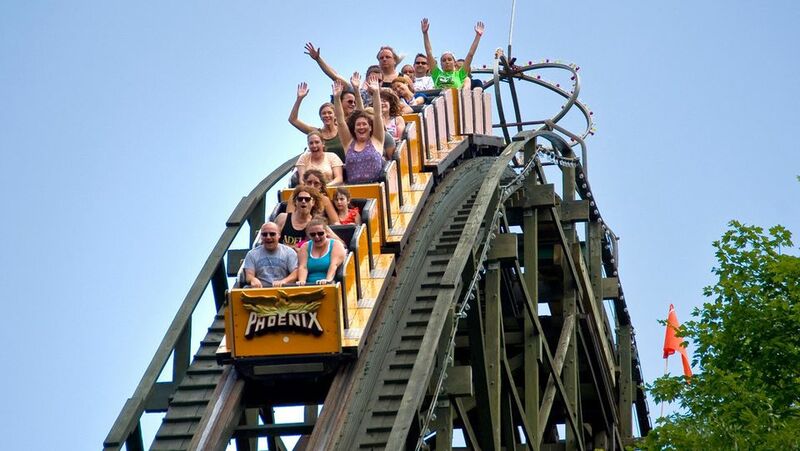 Knoebels takes special pride in its two wooden coasters, Twister and Phoenix. Both of the rides were resurrected from other parks, and both are adored by coaster fans. The Knoebels folks like to tackle projects in-house and designed and built the Haunted Mansion, a classic dark ride that opened to great acclaim in 1973 (and not to be confused with Disney’s Haunted Mansion). The park also built the Flying Turns, a bobsled-style coaster that uses a wooden trough and is an ode to a 1930s-era ride. In 2015, the park opened Impulse, a steel roller coaster that soars up and down a 98-foot vertical lift hill and first drop and includes inverted elements such as a loop and an in-line twist. Other park highlights include Black Diamond, an indoor/outdoor coaster that features a mining theme. Previously located at a park in New Jersey, it is another repurposed ride. It is also another example of Knoebels’ home-grown, hands-on design work. Its own staff developed the coaster’s indoor special effects. Knoebels does not offer a full-fledged water park, but it does include a couple of water slides and a pool as well a watery activity area for younger kids. The park gets high marks for its food, which includes a sit-down, full-service restaurant. Located deep in the Pennsylvania woods, Knoebels is well worth the ride. The park is renowned for its tasty, reasonably priced food. The Alamo is a full-service restaurant with complete dinners available. The pizza at Cesari’s has a great reputation Among the more quirky items available are fried pickles, potato cakes, and Polish platters. Note that the park does offer picnic facilities and allow visitors to bring in their own food. It does not sell alcohol or permit guests to consume alcohol on its property. Since admission is free at Knoebels, the rides are individually priced, and tickets can be purchased a la carte. Discounted ticket books are available. Knoebels also offers pay-one-price options. Discounted prices are available for children (under 48 inches) and for arrival after 5 p.m. Group rates are available. See the park’s official site for discounts and promotions. In addition to free admission, the parking is free. And since nobody is paying to get into the park, the entertainment, which includes music, magic, and puppet shows, are all free. Knoebels is located in Elysburg, Pennsylvania. The physical address is 391 Knoebels Blvd. From I-80 West: Bloomsburg Exit 232 to Buckhorn, PA 42 south to Catawissa. Cross bridge and take PA 487 south for 6 miles to park. From I-80 East: Danville Exit 224, to PA 54 E thru Danville. Across the river, PA 54 turns left to Elysburg. Left on PA 487 N at the light to park. From I-81 South: Near Hazleton, take I-80 and I-81 junction. Follow I-80 West directions above. From I-81 North: Minersville Exit 116. Left onto 901 west to PA 54 west. Right on PA 487 north at the light to park. Knoebels operates its own onsite campground and offers cottages that sleep up to 10 guests.